This easy passwords manager will store all your passwords. Now you don't need to write passwords on paper or in notepad. Category navigation will help to select passwords you need. Search option will help to find password in a large list. All information is encoded, so it's safe to keep it ! 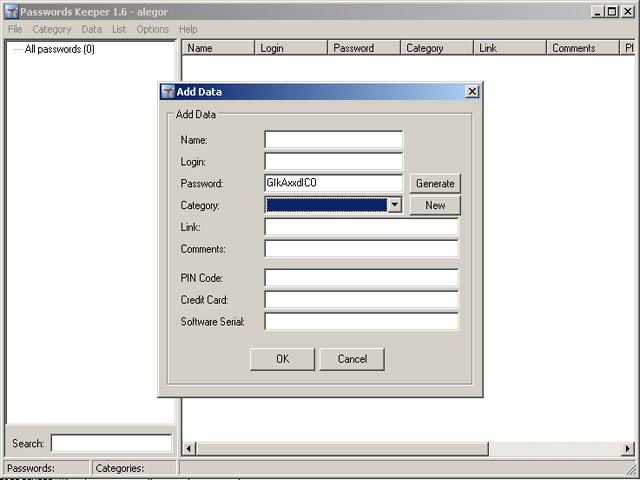 AKeeper is an easy to use Personal Password, Username and Serial Database. PC/MAC Goalkeeper game, with it you can take the role of a great goalkeeper. Qweas is providing links to Passwords Keeper 1.7 as a courtesy, and makes no representations regarding Passwords Keeper or any other applications or any information related thereto. Any questions, complaints or claims regarding this application Passwords Keeper 1.7 must be directed to the appropriate software vendor. You may click the publisher link of Passwords Keeper on the top of this page to get more details about the vendor.